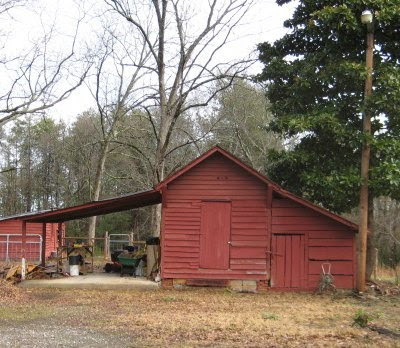 The coal barn is one of the two original outbuildings on the homestead. Why do we call it the coal barn? Well, see that little door on the lean-to section on the right? It stored the coal, which at one time was used to heat the house. There's still quite a bit was left in there. The coal barn is the same age as the house, about 90 years, but hasn't been maintained the same way. It's always leaned a bit and been somewhat rickety, but served for storage and Dan's workshop. Over our five years here, however, it's gotten worse. The floor was so wonky that I almost felt sea sick any time I had to go inside the building. The next major homestead project is a goat barn, right where this one used to be. I say "used to be" because Dan has been tearing it down. We used the carport to store hay. The carport became our hay mow. We covered the sides with tarps to protect the hay from rain. All that remains is one purchased round bale. Our own hay harvest for this year is being stored in the old chicken coop. At one time the building had electricity, as evidenced by the remnants of knob and tube wiring along the ceiling joists (above). Notice too, that the lumber is simply slices of tree (with the bark still on, I might add). The original roof was cedar shake, but had long since been covered by several layers of asphalt shingles. We'd hoped to save and reuse as much of the materials as possible. There's been a lot of termite damage and rotting over the years so that most of it is too old and brittle. It's amazing the building hadn't collapsed before now. About what it looks like now. We'll leave the carport for storage for awhile. The only "find" was an old Clorox bottle. When new barn construction will begin is anybody's guess. Dan's vacation is over and his new schedule looks to be busier than before, so home time will be more scarce. 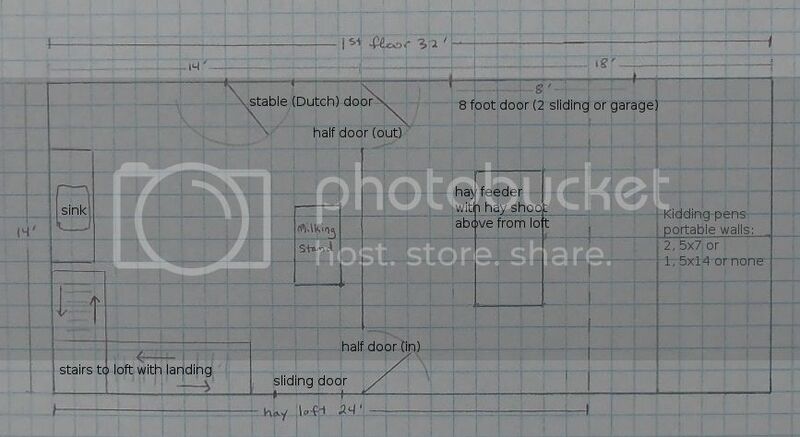 While he's been working we've been discussing our barn plan (here) and exploring other possibilities. We've come up with another idea which I'll have to show you soon. Ooh! That is an exciting step forward for your homestead! Do you allow guest bloggers; would be interesting to have Dan explain a bit about how to determine whether to replace or repair an outbuilding, how to take one down, etc. Maybe in your next book eh? :) Congrats on the newest dream taking shape for you. Talk about some history in this old coal barn. Wow looking at the picture of the wood planks,they're sweet looking. Your homestead is really looking nice, I can't wait to see the final project. That barn looked pretty good in the first picture. I know people up here who use old chicken houses and the like for storage. But it seems like your barn was far gone after you started working on it, so I guess there was nothing else to do. Seems a shame, but there it is. What im loving is those beautiful trees in the background. What a lovely place. I live in the burbs that are not so old and so no trees. I hope the new goat shed will be the same colour. Its such an American colour for barns (which i love). Looking forward to seeing the new goat barn. Our dear friends just got goats and I'm looking forward to working with them and learning more. I've never milked a goat, so that should be interesting! Isn't it amazing how much debris comes from tearing down an old building like that? The plank boards with the bark on them are what we call slabwood around here. They are cuts taken from all four sides of a log before getting to wood that is straight and clean and looks like "real" lumber. Most sawmills toss the slabwood in a big pile and burn it in the winter. We bring it home from a friend's mill, cut it into 16" lengths, then I split it for our kindling supply. The goat barn . . . hooray! Another step toward getting the homestead just as you want it. JW, LOL. I don't really host guest bloggers, although I'd gladly share the blog with Dan. Trouble is, he has no interest on computers. We do a lot of brainstorming and writing together, however. He dictates and answers questions. His behind the scenes contribution is invaluable. Sandy, it was a pretty unique structure and I have mixed feelings about changing things. Still, this one would have come down on its own eventually. Harry, if it had been a sturdy structure, we would have kept it. I think using it, walking in it, and working in it helped deteriorate it. Lynda, we love our trees! All the ones around the two outbuildings are pecans, so we get beauty, shade, nuts, and good cooking wood from fallen branches. Mama Pea, we posted at the same time! "Slabwood" Thank you for that. It's probably called the same thing here but I never thought about it. We kept some, but some was badly rotted and what was left was so full of nails! The guy who built the place would easily put 20 nails in one board. Crazy! It's funny with pictures. Things look one way but they are often very different. What looked nice and usable is probably dump fodder. I LOVE the Clorox bottle. I don't know what it is about old vessels that makes me moony, but I love the raised letters that indicate what was in it. Maybe it is the innate label peeler in me. Thank you for sharing..I love old homesteads...glad you will be able to savage some of the wood. Nice find. around here the best way to get something done is to start taking apart the old. So I'm happy your old barn is gone to make way for the new one. I hope that project goes well. I know that God will lead you to the best path for you. I'm glad it didn't fall down on you and you did get some use out of it until now. It sure does look good until you get up close! That is quite the project to take on. Barb, yeah, it doesn't look too bad in the photos. I should have taken some photos of the floor joists. They were very bad with termite damage. The critters nearly ate through some of them. The leaning had gotten pretty bad too. Renee, that's what we figured, LOL. We really needed to get down to the ground and see what was what. The hardest part will be in the planning. The miracle part will come in being able to buy the materials! Mom at home, me too! Sadly, the other outbuilding will eventually have to come down as well. But that won't be for awhile. Too bad about the termites. I used to salvage old farm buildings for the wood which was amazing. I remember once tearing down an old corn crib full of 2 x 16 oak planks with hardly any knots along their 20 foot lengths. You just can't find that stuff anymore. On a side note, later we used some of those oak planks to raise an outbuilding so that we could store wagons in it. That oak was so tough after 150 years that we had to pre-drill every single nail hole!